This photo shows No 37 one of Brighton Corporation’s three Leyland Panther Cubs No’s 36-38 registration NUF 136-138G with Strachans B–D bodywork, listed on some other sites as B43F which is obviously incorrect as it can clearly be seen to have a centre exit. A further four with Marshall B43F bodies followed on as No’s 39-42 registration NUF 139-142G so maybe 36-38 were to the same layout. The Panther Cub was a fairly rare beast as less than a hundred were built in total and of those only seven had Strachans bodies three for Thomas Bros of South Wales and a demonstrator YTB 771D which was bought by Eastbourne Corporation some time after being used by them as transport for delegates at the 1967 MPTA conference held in the town (Municipal Passenger Transport Association). 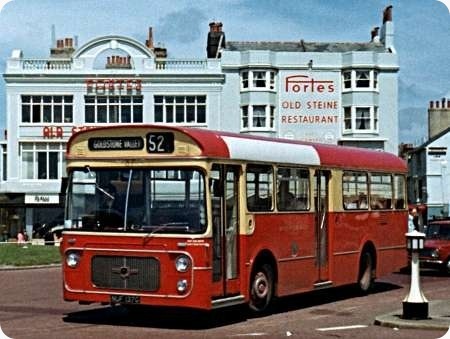 I worked for Eastbourne Corporation at that time and drove YTB both during the conference and after it was bought by them and numbered 92 and always found it to be a pleasant lively vehicle to drive if a bit raucous. The manager at that time Mr R. R Davies said the interior Formica panelling pattern looked like a coffee bar. The Panthers we had at Percy Main were the B48D Marshall Camair bodied PSRU1A1R version, and they too had somewhat garish interiors. Whoever designed the cab layout obviously never had to drive one, if they did they must have been a contortionist. Being a semi auto with no clutch pedal, the designer must have been under the impression that they would only be driven by drivers who didn’t have a left leg. The gearchange was positioned in such a way that it was almost impossible to get into or out of the dammed thing unless you had supreme manoeuvring skills, and once in you couldn’t get comfortable as you had nowhere to put your left leg. I know just what you mean Ronnie. At Halifax we had three ex-Yorkshire Traction Marshall-bodied Leopard PSU4’s which had exactly the same layout. In order to get installed into the cab seat I used to have to climb onto, then over it into the tight space at the other side with both legs, sit down then swivel anticlockwise into position. Then, unless you wound the seat almost down into the floor, your upper legs were jammed tight under the large steering wheel rim, which would rub against them as you steered. Then of course you had to go through the reverse of all that procedure when you came to get out. Having said all that, though cab ergonomics have improved a bit since then, I honestly can’t say that I’m ever comfortable in any of today’s buses, and nearly always finish a stint in one with pains in my back and legs. 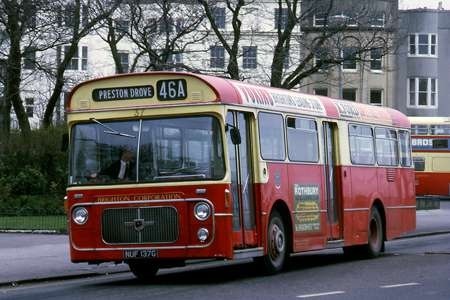 I have happy memories of travelling to school on Manchester Corporation’s Panther Cubs on Middleton local service 142. Queens Road Depot had nos. 72/74/76/78 and 80 (BND 872C etc) and any one of these would appear each morning on the 142; far more interesting than travelling on the school bus, which was always a PD2. The performance was impressively lively; I remember that one driver always started in 3rd gear, and another started in 2nd but then went straight to 4th. I don’t know about the driving position causing problems, Manchester’s Panther Cubs had the miniature gear lever attached to the steering column. However the front platform doors were operated by the driver’s left foot (the centre exit doors being opened by a sixth position on the gear lever), I can’t remember seeing any of them struggle to reach the door pedal. I think your drivers were trying to wreck the gearbox as they disliked the Panther Cubs. I was once on a Halifax Dennis Loline III fitted with a 5 speed semi-auto gearbox and the driver started from each stop in 3rd gear, thinking it was 2nd as on a Fleetline. Giving plenty of body vibration! bus and passengers alike! 5-speed semi-autos could be a problem in fleets that also had 4-speed ones. 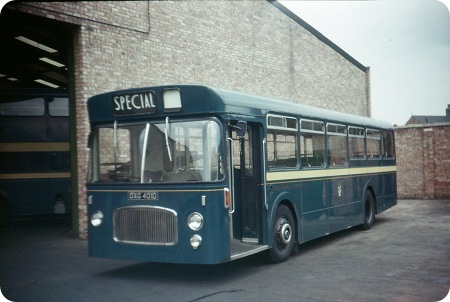 Bristol Omnibus had 4-speed RELL buses and 5-speed RELH coaches and DPs. When the RELHs were cascaded to bus use, the drivers treated gears 2,3,4&5 exactly like 1,2,3&4 on the RELLs, changing up far too early and never letting the engine get into its stride. They must have wondered why these former "express" vehicles were so much more sluggish than the local ones! 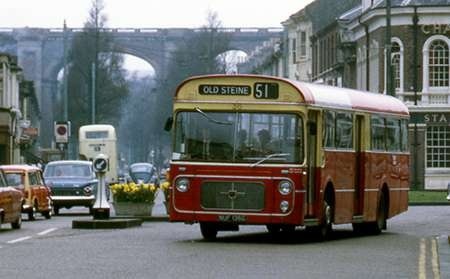 Here are two more pictures from 1970 of the Brighton Corporation Strachans bodied Panther Cubs. 36, NUF 136G is seen at Preston Park, with the impressive railway viaduct behind it, and 37, NUF 137 is in Old Steine, Brighton. 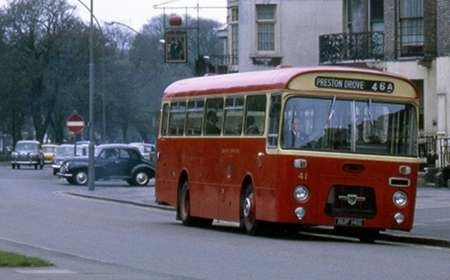 The later Marshall bodied version is represented here by 41, NUF 141G heading north on the A23 towards Preston Drove, with an array of British built cars in the background – those were the days! All of the Panther Cubs for Brighton were dual door from new & remained as such throughout their short lives. They were all withdrawn by 1975. They had been Brighton Corporations first single deckers & it would be 1983 before any more arrived. Not the best shot in the world I think it was the first shot on the film and suffered from a touch of light getting into the cassette. Anyway there are not many shots of duel entrance vehicles on site so I think it is worth showing. The engine on the Panther was positioned horizontally under the floor at the rear and inline with the chassis as apposed to the Atlantean which had a transverse vertically mounted engine. As can be seen in the above shot the seats behind the centre door had to be raised to go over the rear axel and engine compartment. But having the engine at the rear did as can be seen enable it to have a very low step into the vehicle all though there is a step up immediately behind the driver. The coach version of the Panther had a one level raised floor but with having the engine at the rear it meant it had 120 cubic foot (3·4 cu.m.) underfloor storage for suitcases and the like. The engine was the reliable Leyland O.600 six cylinder diesel developing 125 b.h.p. in the bus chassis and 130 b.h.p. in coaches with a four speed epicycle gearbox with fingertip electric change and air suspension was offered as an option. I know you are not meaning to mislead, but you haven’t mentioned that the Panther Cub (as opposed to the Panther) had the well regarded, but noisy, 0.400 engine. This was the final version of the 0.300/0.350/0.375 Comet/Tiger Cub engine. The 0.400 was better known in the Bedford VAL/VAM14 and Bristol LH applications. It was necessary to fit this compact unit to the Panther Cub as it has a shorter rear overhang than the Panther. The power output, at 125 b.h.p, was the same as the 0.600 but the torque (pulling power) and therefore potential life span was less. This bus must of been brand new when I took this picture it certainly looks that way. 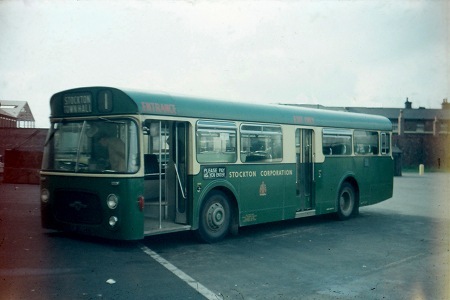 If I remember correctly Middlesbrough Corporation used route letters rather than route numbers which was quite novel. I think they only had 2 single deckers in there fleet this one and its sister which was fleet no 2. I was in the depot at the time this one was delivered. It was put in the paint shop. It smelt lovely. I remember it like yesterday. It and No 2 ran the S route to Seamer. Unhappy memories of this bus! When I was about 14 I used to visit a friend in Newby and get the ‘S’ home, getting off at Kirby School. One Saturday Roman Road was closed so the route was diverted down Orchard Road and The Avenue, then up St Barnabas Road to re-join Roman Road/Ayresome Green Lane. Because the bus stop by the Conservative Club in Orchard Road was closer to home I thought I’d get off there, but the miserable driver wouldn’t stop as it wasn’t a normal stop, and instead took me all the way up to the General Hospital before he’d let me off, giving me a really long walk home. I never trusted bus drivers after that!